With the rise in food costs, pesticides, and GMOs there’s never been a better or more important time to grow your own organic food. Sounds simple enough, but then reality hits: You’re working late again, the kids have to be picked up from karate, and you have no idea what to make for dinner. It’s time to redefine the modern homestead. And, no, I’m not talking about Laura Ingalls or hoping to stir up flashbacks of your grandmother whiling away the days with tons of cabbage and ceramic crocks (although, I do love those crocks!). 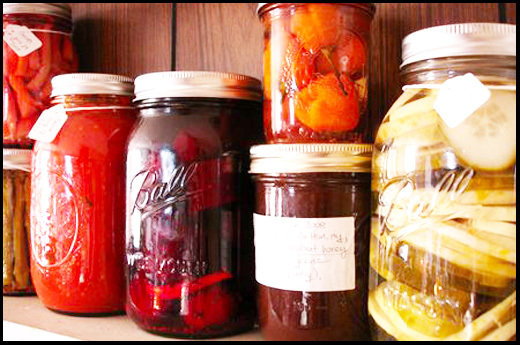 No matter where you live, you can start your own homestead, eat better, and save a ton of money by growing, canning, and storing your own food, in only a few hours a week. Make a garden—anywhere. Whether you live in the city, country, or suburbs, you can grow a garden anywhere. If you are short on space, try growing a windowsill herb garden or a few container lettuce plants, for greens any time of year. Most lettuces and herbs can do just fine in a sunny windowsill, and you’ll love picking fresh herbs or a homegrown salad for your next dinner party. Reduce. Reuse. Replant. Forget having to buy a lot of tools, or planters—everything you need to get started can be found in your recycling bin. Plastic salad containers are the perfect mini greenhouses for starting seeds or growing windowsill herbs. You can also make mini planting pots out of newspaper and plant the seedlings you start in them directly into the garden. Grow your own groceries. Plan a grocery garden by growing varieties that your family likes to eat. If your family loves pickles, plant cucumbers! Or, maybe you’re tired of paying a lot for kale chips, hot sauce, or canned tomatoes—try growing the veggies and then making your own. Every little bit helps, and you’ll save you a ton of money and know it’s been organically grown. Direct-sow to save time and money. Buying starts at the local nursery can be addicting, and before you know it, you have a full cart of happy new plants (and a hefty pricetag to boot). Try direct-seeding zucchini, cucumbers, lettuces, pumpkin, melons, herbs, and other short-season crops right into your garden. You’ll have healthier, stronger plants that produce faster without the shock of transplanting, for only the cost of a packet of seeds. Stock up and store. When your garden is bursting with tomatoes or the farmer’s market has a flood of peaches, now is the time to stock up for the year. With just a little planning, you can store food at its freshest and have homegrown food all year long. Canning, freezing, pickling, and dehydrating are fantastic ways to store food, and will keep your family well stocked with organic produce when winter hits. We recently launched a Kickstarter campaign to get the word out about homegrown food, and had people from all over the world inviting us to stop at their city, check out their farm, or visit their community garden. So, this summer, we are Amtraking across the country, to spread the word about how easy it is to grow your own, organic, non-GMO food, and we’ll be sharing our stories from the road. We will be trekking to Seattle, Portland, San Francisco, Denver, Boulder, Austin, Asheville, and Philly, with book-signing events and homesteading demos at urban garden centers, community gardens, and bookstores across the country. I’ll be blogging along the way, so stay tuned for upcoming events, and photos from the tour! 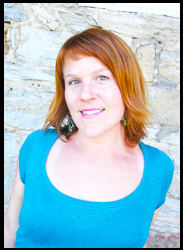 Robyn Jasko, creative services director at Runner’s World magazine at Rodale, is a local-foods activist, community garden starter, and cofounder of Grow Indie, a site promoting sustainable lifestyles, homesteading, eating well, and living local. Her first book, Homesweet Homegrown: How to Grow, Make and Store Food, No Matter Where You Live, was just released on May 1. Something that crossed my mind the other day, while I was hunting for likely trout brooks to drop a line in, as I passed through the local corn fields that still laying fallow this spring, do those farmers ever let their neighbors know if they are growing a patented crop? Since there are about 90 GMO’d food/feed crops(not all approved yet) it is getting harder to know if the beet, or melon or alfalfa field has been sown with engineered seed or not. It will make a hugh difference on what people can grow near these fields and whether or not there will be a reduced population of pollinators in the area as well. Some other things to remember…. Encourage solitary bees to live in your immediate area by providing safe food and habitat for them. Minimize the use of herbicides and pesticides to absolute must have because you are about to lose your crop – then find a way to keep the pollinators off of it for a time using row covers if possible, don’t spray the blossoms and hand pick as many pests as possible. Hygiene is the best way to defend against fungus and disease. Clean tools, pick up any debris and stay out of the garden when it is wet! You will spread spores easily on your clothes. Stay on top on what the larger farmers are growing nearby so you do not unknowningly contaminate you own garden. We love your food article! Growing Kale and making Kale chips yourself is easy and saves tons of money. Growing plants from seeds in your window is a great way to get a jump on the tomato season too!